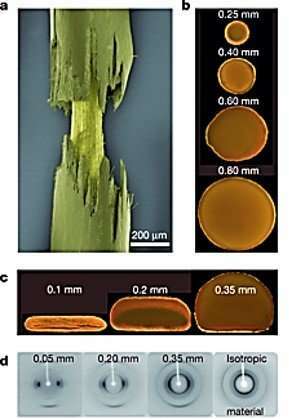 Biological materials from bone to spider-silk and wood are lightweight fibre composites arranged in a complex hierarchical structure, formed by directed self-assembly to demonstrate outstanding mechanical properties. When such bioinspired stiff and lightweight materials are typically developed for applications in aircraft, automobiles and biomedical implants, their manufacture requires energy and labor-intensive fabrication processes. The manufactured materials also exhibit brittle fracture characteristics with difficulty to shape and recycle, in stark contrast to the mechanical properties of nature. Existing polymer-based lightweight structure fabrication is limited to 3-D printing, with poor mechanical strength and orientation, while highly oriented stiff polymers are restricted to construct simple geometries. In an effort to combine the freedom of structural shaping with molecular orientation, 3-D printing of liquid-crystal polymers was recently exploited. Although desirable shape-morphing effects were attained, the Young's modulus of the soft elastomers were lower than high-performance liquid-crystal synthetic fibers due to their molecular structure. By structure, the rigid molecular segments of aromatic thermotropic polyesters could self-assemble into nematic domains at temperatures higher than the material's melting temperature. Polymer melt extrusion through the 3-D printer nozzle gave rise to shear and extension flow fields that aligned the nematic domains in the direction of flow. A temperature gradient subsequently formed between the cold surface of the filament and its hot interior for rapid cooling at the surface, causing solidification in the flow-aligned arrangement. Polymer chains present in the interior of the filament experienced slower cooling to re-orient, driven by thermal motion. As a result, the extruded filaments possessed a core-shell structure in which a highly aligned skin enclosed a less oriented core. The thickness of the skin relied on the diameter of the filament and the operating temperature. The effect of the printing parameters on the final core-shell architecture was decided using a simple analytical heat-transfer model. The authors used optical microscopy and X-ray scattering experiments to confirm the highly aligned skin structure. 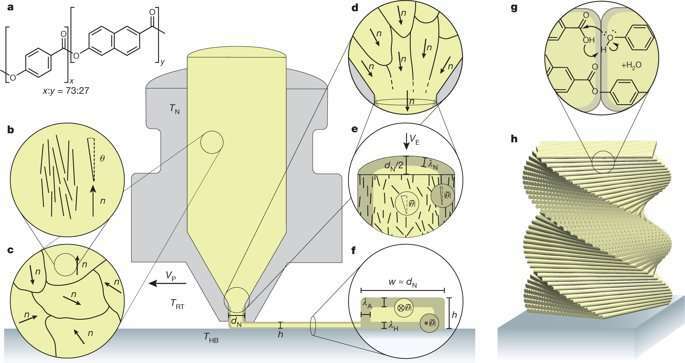 The core-shell filaments demonstrated significant mechanical strength and elastic modulus, in contrast to previous studies that used fused deposition modeling (FDM). The Young's modulus of the material relied on the production of filaments thinner than the nozzle diameter for effectively improved stiffness and strength of the printed materials. Additional factors including the manufacturing temperature, layer height, molecular crosslinks and annealing time affected the Young's modulus of the printed materials. The material construction enabled self-assembly and hierarchical macromolecular cross-linking strategies via layer-by-layer additive manufacture to replicate bioinspired design principles. High-performance laminates with higher strength and Young's modulus without damping loss were achieved by tuning the fibre orientation to best match the stress lines throughout the mechanically loaded structure. The ensuing product demonstrated characteristics unprecedented in lightweight materials.